Hotel James is located at 10 Lost Dutchman Dr. in North Chico. Lost Dutchman is your one stop destination extraordinaire. Before retiring to your room, enjoy a romantic dinner and wine at Wine Time. When you wake in the morning, treat yourself to a delightful breakfast at Roots Restaurant located right next door. Visit Lost Dutchman Taproom to get your fill of craft brews; and coming soon, Strong Water. ​ Refresh your spirits with a visit to Lost Dutchman. Are you getting married soon? Having a large get together of family and friends? Stay at Hotel James. When you book all five rooms, receive a 10% discount off each room. 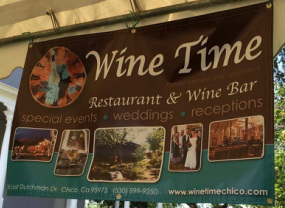 Wine Time is right next door and is a great place for events, receptions, rehearsal dinners and weddings.